This family, containing 5 genera and 26 species, is found only in the tropical forests of Central and South America. It includes the marmosets and tamarins. Marmosets and tamarins are among the smallest primates, with head and body lengths as small as 130 mm and tails of 150 mm. Adults of the pygmy marmoset weigh a mere 100 grams! The face is very sparsely furred or naked. The pelage is soft and silky, and often includes characteristic tufts of hair on the head. Coloration is variable and in some cases quite striking to the human eye. 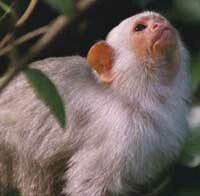 Unlike many other New World primates, marmosets do not have a prehensile tail.